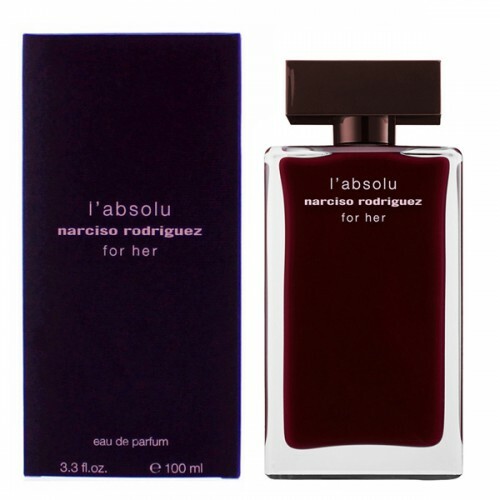 Narciso Rodriguez for Her L'absolu fragrances exclusively for your pleasure and for love. Narciso Rodriguez for Her L'absolu 100ml. Eau De Parfum is unusually strong and seductive fragrance for the brave women who walks with his head upright and able to conquer his surroundings. Scent Narciso Rodriguez For Her L'Absolu conceals a touch of mystery and perfectly symbolizes femininity, beauty and attractiveness. Become a woman that men want to gain! Ingredients women's fragrance by Narciso Rodriguez For Her L'Absolu opens graceful floral notes of jasmine and intoxicating tuberose. Heart musky scent interestingly contrasts with the warm tones of sandalwood. Seductive amber and patchouli exciting enhance the sensuality of this fragrance. Unusually captivating women's perfume Narciso Rodriguez For Her L'Absolu is perfect for passionate appointment! Wherever you enter, you wake up the attention of men who instantly longs to decipher your secrets. But it remains perfectly hidden in a bottle flacon Narciso Rodriguez For Her L'Absolu. Discover the unique charm of luxury women's fragrance by Narciso Rodriguez For Her L'Absolu and enjoy the perfect interplay of tones every moment of your day. Dark purple fragrance flacon is made of solid glass and perfectly expresses the imagery of intensity, determination and mystique of this fragrance. Perfume is enclosed in a traditional bottle. He, as always, looks very stylish and elegant. The fragrance is part of a group of floral, woody and musky. Notes of jasmine and tuberose fragrance open sound. They smoothly into the musky heart. The warm and sensual notes of patchouli and sandalwood complete the composition.